The 51st State Solar Co -op is open to all District residents. If you live in a low to moderate income household, you may qualify for grant funding to cover the cost of your solar array. The array covered by the grant will offset up to 50% of the household’s energy usage. If you have it, please attach a copy of your electricity bill that shows your annual electricity use. It's OK if you can't find it now, but the installer will need it later. You can attach a copy of your bill from online, or if you have a paper copy then you can attach a scan/picture of the bill. Certain income qualified homeowners may qualify for the installation of a solar system at no cost. 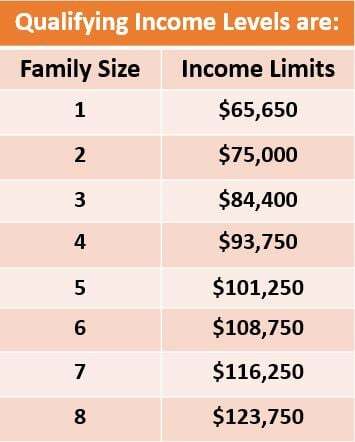 Refer to the finance requirement chart below to see if you may qualify. Are you interested in learning more about our efforts to provide income qualified homeowners no cost solar systems? Do you have any questions or concerns about going solar, or any general information you'd like us to know? If you're definitely planning on replacing your roof or if you have a second property you want us to look at, this is a good place to tell us!